We went to a rock ‘n roll show Saturday night, and while standing in line, I realized I didn’t “fit in” with the rest of the crowd. In a sea of hipsters, I resembled a suburban dad. Granted, I am a suburban dad, but there’s no need to look the part out in public. Any survivalist will tell you the key to success is blending in with your environment. With that in mind, I have decided I want to look more Portland. (For the record, that would be Portland, Oregon – not the “other” Portland, in Maine. I imagine everybody there looks like they stepped out of an L.L. 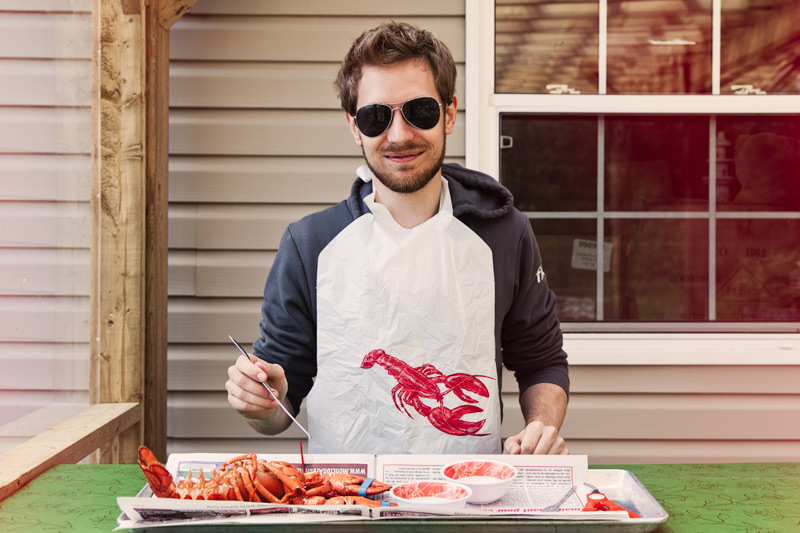 Bean catalogue and owns a different lobster bib for every day of the week). Granted, I’ve made some positive strides over the years. “At least you’re wearing Kicks instead of white tennis shoes,” Tara pointed out. I may have the footwear figured out, but I’m way off base with the rest of the outfit. Take my black cargo shorts, for instance. Seriously: take them away when I’m going out to a concert! Everybody else was wearing jeans. I was sporting a Pink Floyd t-shirt, while the rest of the crowd looked like they were ready to ring in the new year (if the new year was 1994). One word: flannel.They wore beanies or hats while I displayed a $14 haircut from Great Clips. Oh, the shame. My big mistake was dressing for comfort. It was a warmish evening, and I was too concerned with feeling cool when I should have realized my lack of sleeves and long pants would only serve to highlight the fact that my arms and legs were embarrassingly free of ink. They were smirking at my clean-shaven face through their whiskers, I just know it. I have a better idea. Instead of writing about the essential items needed for that “Portland” look, I’ll present them visually. Yes! This is perfect. Look out, Portland! I’m convinced that Portlanders wear flannel shirts all day, change into flannel pj’s, sleep in flannel sheets, and then repeat the next day. Don’t forget, we like to put a bird on it, too! Oh, I could never forget that. I rarely see the flannel shirts here, but the rest of the look? Yeah. It just looks dumpy to me, but my kids howl with laughter at the attire I wore in my 20’s (button downs with skinny ties). We all think we’re cool at that age. I know what you mean. My daughter finds the very idea of bell bottoms hilarious. And then she’s off to school wearing skinny jeans, a t-shirt that says SWAG and a snap back. Yes, but Mark, I have always thought you to have that cool, open and wonderful energy that Portland is known for. So it doesn’t matter what you wear. You’ve got the true spirit! LOVE that last photo and caption! Aww…thanks, Ron. I do like to think I embody the spirit of the place! Now you see why I go to shows like The Eagles and Steely Dan, to offset those concerts by artists born after the Ford administration! That’s not a bad strategy! I didn’t feel out of place at all standing in line waiting for Crosby, Stills & Nash two weeks ago. But Built To Spill at the Crystal Ballroom Saturday night? Totally different story! Can’t help with Portland but lots of ice cream makes you more Portly. Get a tattoo of geoduck. Oh, Jess. That would be wrong on so many levels. YOU know why! Hey, you have to be you! As I get older, I realize people pay far less attention to other people than I thought they did when I was younger. Most people are so caught up in their own worlds, unless we have something that makes us stand out in a crazy way, we mostly just blend. Actually, that’s true. This post sort of contradicts an earlier one I did about not giving a damn what other people think. Oops! Maybe a compromise is in order. I’ll roll up the sleeves on my flannel shirt to counteract the warmth. Well you should try living in Texas, try fitting into the Texas vibe and then scratching your head in wonderment. Yes, I live here and have most of my life. I own a pair of cowboy boots (red though). I lived in Seattle for years also. Here is my thought, why try to fit in. Why not just do you, you is cool as can be. You works.